Ah, angst. When women are stressed out and dealing with emotional, life changing events, they tend to worry themselves to no end. For a book with dogs in the title and two canines gracing the cover, this comes as a bit of a surprise to those expecting a warm and fuzzy read. 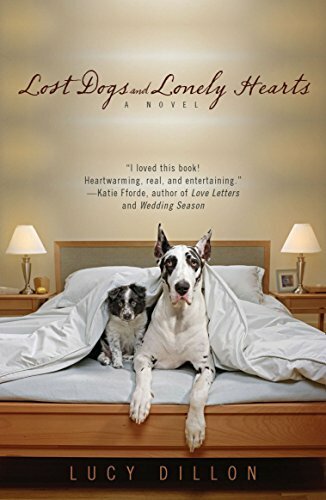 With the introduction to an American audience of her U.K. release Lost Dogs and Lonely Hearts, author Lucy Dillon is hoping to connect with readers who fell in love with über-successful, pet-themed novels like Marley & Me and Dewey the Library Cat. But what sets this story apart is not its four-legged characters, but rather the well-rounded, realistic depictions of three women facing the day-to-day struggles of ordinary life. Rachel, Zoe, and Natalie are not superwomen, but neither are they one-dimensional puppets used to advance a weak plot. Their inner motivations and thought processes ring true. They say things they shouldn’t and behave in ways that are inappropriate. But that’s what makes them real. They have problems and issues that they are doing their best to deal with. What helps them through the hardships and frustrations are their dogs—who remain steadfast and loyal amidst the psychological tumult. Rachel is the super chic, London career woman. At 39, she leaves her married lover and her prestigious job to run her deceased aunt’s boarding kennel/dog rescue. She also inherits her Border Collie, Gem, who serves as a guide helping her negotiate the path from getting her hair cut in a posh salon to cleaning cages on her hands and knees. Add to the mix George, the town veterinarian, who the local women whisper looks just like Daniel Craig. Just when Rachel thinks she might be able to adjust to her new life in the country, an unexpected revelation and a visitor from her past threaten to disrupt her newfound serenity. Zoe is the newly divorced mom of two young boys. When her husband cheated on her and ran off with a younger woman, she was left holding the bag. Struggling to make ends meet on a hairdresser’s salary and battling for alimony and child support, Zoe finds that her ex has selfishly dumped Toffee, a new Labrador puppy, in her lap in order to buy his sons’ affections. At her wits’ end trying to keep things together, she turns to Rachel for help. They agree to a weekday doggy daycare arrangement with Zoe agreeing to walk the kennel dogs on Saturday mornings as a part of a volunteer group. Little does she realize that this setup will lead her right into the arms of the handsome Dr. Bill. Finding herself more and more attracted to the charming physician, she must steel herself against his anti-children proclamation especially since she never worked up the courage to tell him that she’s a mother. Natalie is on the fast track to promotion as a marketing executive when her company unexpectedly lays her off. With ample time on her hands, she decides along with her husband, Johnny that they can now focus on starting a family. However, their plans go awry when Natalie fails to conceive. As the stress starts to mount regarding infertility treatments and doctor visits, they decide to serve as foster parents to a Basset Hound named Bertie from Rachel’s kennel. As they start to drift apart and blame each other for their conception troubles, Bertie becomes a vital link in helping them remember what’s most important in life. While Lost Dogs and Lonely Hearts isn’t exactly a relaxing escape from reality, it does paint an accurate picture of the issues facing women in today’s society. Ms. Dillon expresses the turmoil bubbling beneath the surface of everyday life from financial problems to relearning how to date. She creates viable, likable female characters facing these issues with the help, love, and support of their canine sidekicks. Overall, this is a more introspective and fully formed narrative than the average chick lit/pet story.